Creation stories are mythologies that attempt to quell questions about the source of existence, emergence, or radical change, especially in cases where there is no overt cause. In 1999, I began endeavoring to decode multiple ancient creation mythologies, so as to capture their singular essence. One morning (circa 2000) a strange formula appeared on the chalkboard of my mind. Unlike the collage of patterns I usually perused while lingering between the states of dreaming and waking, this formula shone alone, crystal clear and shockingly bold. Without warning or instructions, this Enigmatic Formula seemed to have come out of “left-field”. As explained in the landing page for this unit, my mathematical skills at that time were inferior even to contemporary middle school students, so these algebraic terms were foreign to me. Eventually, I solicited a tutor to interpret the formula’s symbols and teach me how to solve it. We went as far as we could without knowing the numerical values for the variables ‘a’ and ‘b’. Back then, I was focused mainly on the original two-by-two grid model of Quadernity, in which visible/physical actualities (Quadernity’s lower quadrants) are in feedback with invisible/metaphysical potentialities (upper quadrants). 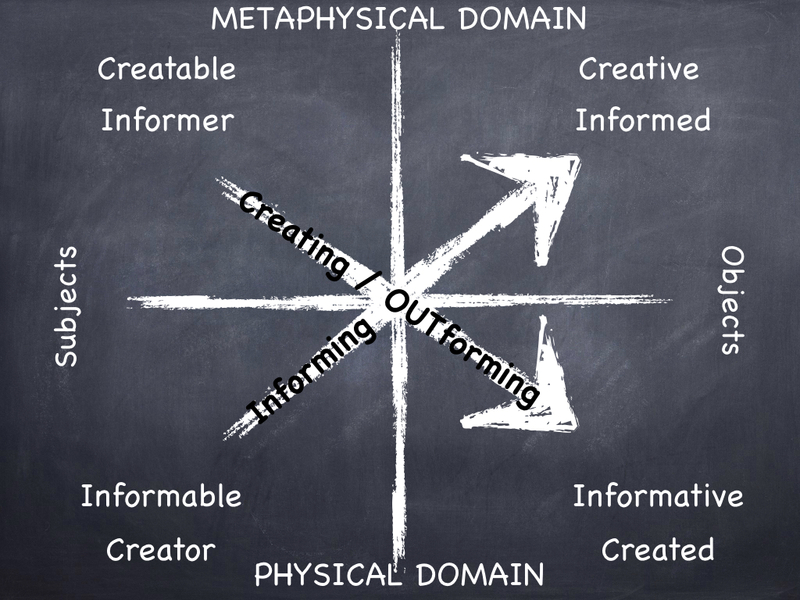 In the physical domain of Quadernity the Subject and Object are singled-out in a public relationship, and in the metaphysical domain the Subject and Object are privately mingled-in. 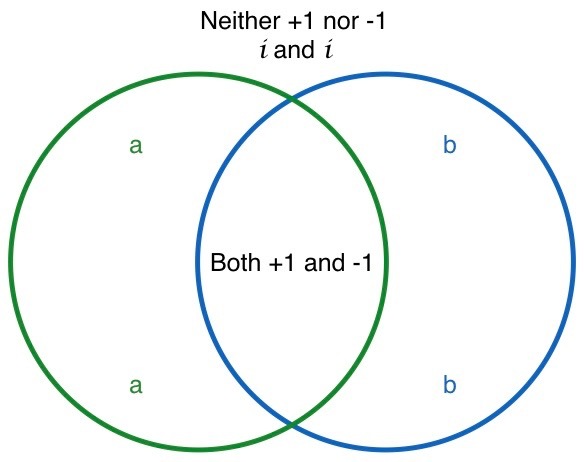 When Phi (1.618) and phi (.618) were eventually recognized as “portals” providing inverse passageways between the contiguous domains (upper/metaphysical and lower/physical), the unique pair of numbers became the logical applicants for the vacant variables. With the variables in place (circa 2002), the calculations could be concluded. Shockingly, while solving the formula, each and every one of the formula’s original terms was canceled out, leaving no trace of whence the final solution came. From the nullified had come a non-null quantity. The Enigmatic Formula turned out to be a creation story in its own right! and the final calculations that show Something apparently coming from Nothing. Dare I concoct a creation story to explain how it is that my dreams delivered to me a creation story to answer my searing question about creation stories? Perhaps it’s better that I allow the chapter below to reveal, step-by-step, how Something can come (apparently, though not actually) from Nothing. How could we possibly better understand creation stories than by having one to unravel ourselves? When things leave no trace of their prior causality, their quantized phenomenal existence becomes a matter of curiosity to some. In an attempt to rationalize the unknown, all manners of speculation come from occupational observers of the lower quadrants. and the other speculated by quantum physicists working at the minutest of scales. The former tells of a Big Bang, an exploding “singularity” that produces what has become the space-time and matter of our cosmos. The latter tells of virtual particles that randomly pop out of a vacuum/void like bubbles in a freshly-poured glass of soda. Both of these stories are limited by a lower-quadrant perspective, as it is only from “this side of the veil” that emergence can first be detected. Concerning the (pre)space-time cause of the Big Bang explosion, which supposedly delivered both space and time, there is a virtual speechlessness; and regarding the roiling ‘ground state’ that continuously produces emergent particles, all go mute. Scientists, by definition of their profession, adhere to a rule that conflates what is “natural” with measurability and empiricism. This rule confines their investigations to what Quadernity calls the ‘lower quadrants. As investigators, the scientists are subjective* Observers (Lower Left Quadrant) who determine that objective* reality is whatever they have Observed (LRQ). *Here, the terms ‘subjective’ and ‘objective’ have not been capitalized. This is to signal to readers to apply the definition more familiar to philosophers. See Essential Vocabulary. When capitalized, we apply the definitions proffered by Quadernity. (Subjective means ‘at the cause of’, and Objective means ‘at the effect of’, an action.) In the same paragraph, Observer and Observed were capitalized; this is because the definitions applicable align with both Quadernity and quantum physics. Quadernity establishes that the Subject/Observer is causal Creator and the Object/Observed is the effective Created. Quantum physics says that particle/waves have no objective reality until observed. Mathematicians were never obliged, by virtue of their trade, to agree to the standards of Positivism so they routinely measure meta-physical abstractions. Therefore, scientists call in mathematicians (if they have not yet become proficient mathematicians themselves) to investigate (not with microscopes or telescopes, but with computer algorithms) the statistical (read: quasi-measured) probabilities of sub-empirical circumstances*. *The word ‘circumstance’ derives from ‘circum’ (around) + ‘stare’ (stand). Circumstance is what ‘stands around’ incidental happenings. Circumstance is the prevailing ‘condition-in-which’ an occurrence “takes place”, or comes into existence. Mathematical statisticians provide positivistic scientists a kind of bridge, or gray area between their black-and-white parameters (immeasurable possibility vs. measurable actuality). It is important to the scientists that the mathematicians’ calculations indicate the eventuality of some Particularity; in other words, the maths must predict a property (spin, charge, mass), an outcome (field, dissipation of energy/information), and/or an effect (impactful force) that suggests a particle. Neither scientists nor mathematicians, however, presume purpose (telos) or agency (intelligent design) behind manifestation; such ideas are left to philosophers. I am neither constrained to the rules applied to professional scientists nor by the logic structures ordained by the profession of Philosophy. And having not been taught the “right” way to do math, I apply my intuition for patterns to relationships between numbers and their functional symbols. Readers who have arrived at this chapter without skipping previous chapters of the blog-book are well-prepared with an understanding that the original two-by-two grid model of Quadernity, depicted above, is functionally equivalent to the Pragmatic Schematic Model. These two models differ only by the vantage points they offer, similarly to how you acquire different impressions of a fish tank if you view it from the front and from the side. The Pragmatic Schematic was used in the chapter just prior to this one to lay out a radically new, Nature-Based Number Line. In this chapter, we will use the PS again, this time to survey the solution of the enigmatic formula in the lens of Quadernity. The solution to the enigmatic formula is -1(3). When I look at this specific arrangement of figures, I notice that the 3 appears bounded (it is inside the parentheses), so this translates to a vision of three units within the walls of the PS. The -1 appears unbounded (it is outside the parentheses), so I imagine something receptive, an emptiness longing for one, out beyond the walls of the PS, in what has variously been called the synapse, the bardo, the transcendent gap or Quadernity’s Rest state. Having assigned the variables ‘a’ and ‘b’ the values Phi, 1.618, and phi, .618, respectively, we understand that these are inverse numbers. Opposites go in the outer crescents. The formula gave us two ‘a’s and two ‘b’s. We put them in the outer crescents, as seen below. Squaring ‘a’ we get 2.618, and squaring ‘b’ we get .382. The sum of a² and b² is 3, which we can think of as three ones (all positive). The word BOTH is a signal telling us to put these two roots into the central area of overlap (Vesica Piscis or mandorla), as we have done in the graphic above. 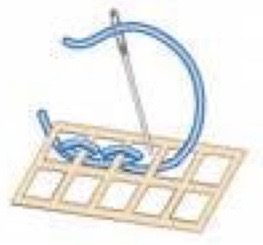 This position is doubly bound, being the position bound between the pair of opposite crescents, which are themselves bound within the walls of the PS. We do not square the +1 or -1 because the formula gave us only one each of these terms. When combined +1 and -1 cancel to zero. Like a particle and antiparticle, they annihilate upon contact. Therefore, the value within the entire span of the PS remains at 3, or three ones. The unbound -1 is in the exact opposite position of the maximally bound. NEITHER the square of +1 nor -1 can deliver -1. (This is true for the same reason that BOTH +1 and -1 were roots of 1: all numbers, whether positive or negative, produce positive numbers when squared.) The existence of √-1 is recognized only by the product of its self-conjugation. √-1 x √-1 = -1. The Tao that can be told is not the eternal Tao. The name that can be named is not the eternal name. The nameless is the beginning of heaven and earth. The Tao is the Ground state, the Rest from differentiations, the source and sink of all differentiations, the solution in which all is dissolved and from which all solutes fall, only to be resorbed eventually. There was neither non-existence [square of -1] nor existence [square of +1] then. What was then, in the beginning, is not relevant to anything we encounter. Perceptible encounters require content (voluminous existence, the counted) and context (relative non-existence, the discounted). The ten thousand [perceptible] things are born of being [roots of +1]. Being is born of not being [roots of -1]. i x i = -1. As seen in the PS reprinted below, the two is are transcendent to the three within the bounds of the PS. We conjugate the two is given in the formula: (ai+1b) (ai-1b). i² = -1. We square both ‘a’ and ‘b’ because we were given two each in the formula. Their sum is 3. We cannot, however, square the +1 or -1 because only one each was given by the formula. Their sum is 0. We are permitted to rewrite the solution to the enigmatic formula as long as we do not change its value: -1(3) equals i²(3 ones). ‘Q‘ing up the -1(3) as we have, has given us a total of three ones within the PS and -1, the conjugation of the two is, outside the PS. Well, not so fast. Overlooked is a subtlety that should be corrected before going any further. See the “Butterfly Effect“. With all of the terms from the enigmatic formula before us, we shall now re-engineer its solution. We will arrive at the very same solution, however, from a different track. We have accounted for the two ‘i‘s, which are the square roots of negative one. i² = -1 and -1² = +1. No modification is needed here. The formula gives us two ‘a’s and two ‘b’s. As indicated by the mathematical method of obtaining the formula’s solution, we squared them first and then took the sum of their squares to get the answer (3). Here, we must reconsider our approach. Way back when we were looking for “portals” we asked what pair of numbers could be both inverse of each other and differ by 1. By way of the yucky quadratic formula, we found there were TWO solutions: +1.618 and -.618. The inverse of 1.618 is .618; they also differ by 1. The inverse of -.618 is -1.618; they also differ by 1. For the purpose of our nature-based number line we needed only the positive pair of numbers, for there are no zeros nor negative things in the natural world. So, for this good reason, only 1.618 (a) and its inverse, .618 (b), are displayed on the new number line. Well, the time has come to revive the forsaken pair of inverted numbers: -.618 and -1.618. After all, the enigmatic formula came in an abstract dream and is, therefore, not bound by constraints of the natural world. Multiply a x b: 1.618 x .618 = +1. Multiply a′ x b′: -.618 x -1.618 = +1. Below, we will compare, side by side, two Pragmatic Schematics, illustrating the difference between the two methods of deriving the solution -1 (3). In the PS to the left are displayed the positive only Phi and phi variables. By squaring these terms and summing them, we got the value 3. (1.618² = 2.618; .618² = .382; 2.628 + .382 = 3). The +1 and -1 in the Vesica Piscis annihilated to zero. In the PS to the right are displayed the terms of the formula, updated to use both the positive and negative sets of Phi and phi. In the left crescent we multiply the negative inverse numbers, a’ x b’, to get 1. (-1.618 x -.618 = 1) In the right crescent we multiply the positive inverse numbers, a x b, to get 1. (1.618 x .618 = 1) Thus we have acquired two of the three ones that we are expecting from our solution of (3). One is One; there are no other ones on our new number line. That central One is now our third (1)! You may be wondering why we we went to all the trouble of this revision when the solution remains the same. There are two reasons. The first is the same reason why Quadernity insisted upon having a new number line centered on a unit of 1, rather than 0: Setting aside our debt-based economy, it makes no sense to center a number line on zero. We rarely focus our attention on Nothing. Anything we center our attention on becomes a Something. Whatever Particularity that Something comes to be, it comprises Smaller Parts, and is a constituent in greater-levels of Participation. Its intra-dimensional scales span a hierarchy comprising the holographic-fractal of Conscious–Corporeality. Representing this so-called “holarchy” is our new number line, brought forward from the previous chapter and reprinted below. In facilitating our endeavors to include all four quadrants in practical problem-solving and philosophical quests alike, our new number line must represent the fractal Corporeality in communion with the holographic Consciousness. The “golden” proportion holds at every dimension because .618¹ is to 1 (.618°) as 1 (1.618°) is to 1.618¹. Instead of sequentially adding a unit of 1 with each step to the right, or sequentially subtracting a unit of one with each step to the left, the new number line counts outwardly in both directions by exponents, or powers of the base numbers, Phi (1.618) and phi (.618). Positive exponents multiply the unit 1 by the base (Phi or phi) however many times the exponent dictates. Negative exponents divide the unit 1 by the base (Phi or phi) however many times the exponent dictates. For every positive exponent there is a negative exponent of the same integer value on the other side of the unit 1. 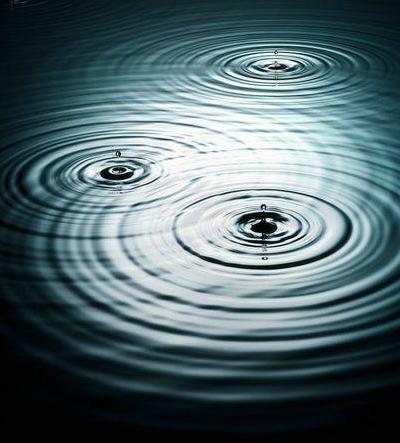 We can imagine the scales/dimensions radiating outwardly as concentric circles from the central Particularity, the unit 1, resembling what happens when a pebble is dropped in a lake. 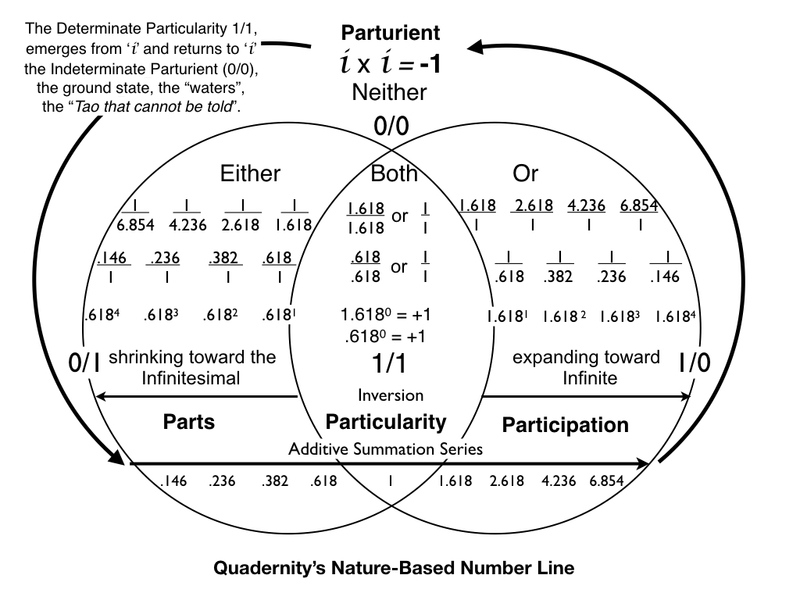 The inversion of numbers at the central unit of 1 shows the fractal hierarchy of Corporeality, from the smallest of Parts (left crescent, approaching 0/1) to the grandest of Participation (right crescent, approaching 1/0), all while conserving the energy or Beingness/Oneness, which multiplies its OUTformation only by its simultaneous self-division. Only the golden proportion of Phi and phi can possibly accomplish this remarkable parallel progression of equivalent values. We can see the scales/dimensions (exponents) of fractal Corporeality inverting at the center-point of unification, as a selected Particularity, while equivalent values, column by column, also progress additively from left to right, showing a moment-by-moment appending of Conscious memories. That was a long answer explaining only the first of two reasons to re-engineer our solution, -1(3), or i²(3 ones). The second reason critically involves negative phi and Phi, our reclaimed -.618 (a’) and -1.618 (b’). I will beg-off explaining this reason in full for now, but promise that when we get to the unit, The Manipulable Model, the mental labor just invested will payoff! How can two such differently worded stories actually be describing the identical situation: whence Being first became? In retrospect, I can say with all confidence that my dream of this formula came in direct response to my deep longing to understand how creation stories can be decoded so that all are understood to express the same meaning. This amazing and enigmatic formula, along with various Quadernity models, offers spectacular evidence that answers do come when beckoned, even if we are not quite ready to understand them. I had asked a deep question when my mind remained relatively shallow; therefore, the extraordinary elegance that correlates this specific formula to the creation stories which initially piqued my interest was lost on me for more than a decade. Fortunately, with persistence over many years, comprehension came; and it was accompanied by absolute astonishment. 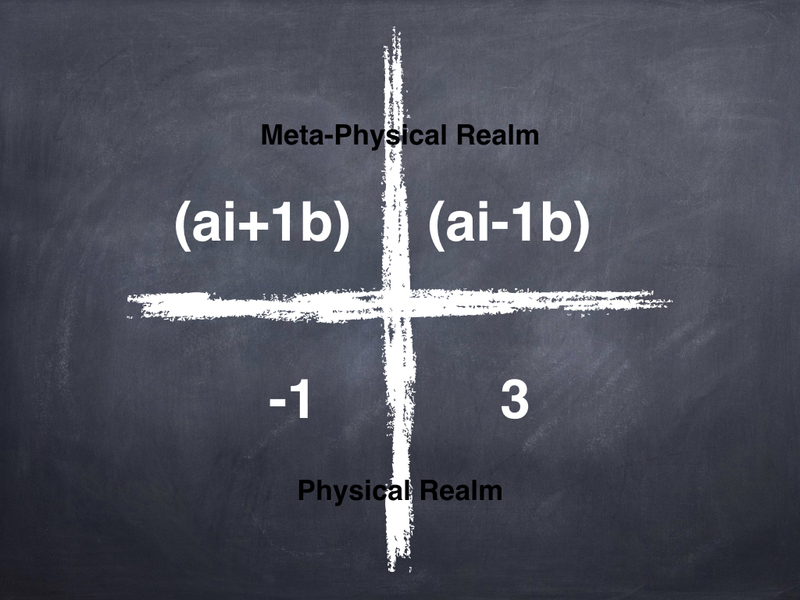 By solving the enigmatic formula, we become privy to a process by which two metaphysical/upper quadrant partners (algebraically represented as (ai+1b) (ai-1b)) ushered forth the physical/lower quadrant partners in Conscious Corporeality. It was not that Something came from Nothing, as it first appeared, but that Something had come from a private relationship hidden in the meta-physical dimension (upper quadrants). Despite their mystical conjugation, (ai+1b) (ai-1b) remained incognito, while products of their relationship were translated into the lower quadrants. More specifically, the Female Object, the INformative/Created (3) descended into the Lower Right Quadrant; and the Male Subject, the INformable/Creator, -1, occupied the LLQ. To observe, our perspective must transcend that which we observe. The Observer in the lower left quadrant is -1, which is outside the bounds of the parentheses. Also, to observe, we must have receptivity, a deficiency, if you will, which is denoted by the minus sign (-). To be observed, an Object must be expressive, or excessive, but within bounds. The Observed (3) is bound within parentheses and is a positive number, possessing an excess beyond the neutral value of zero. 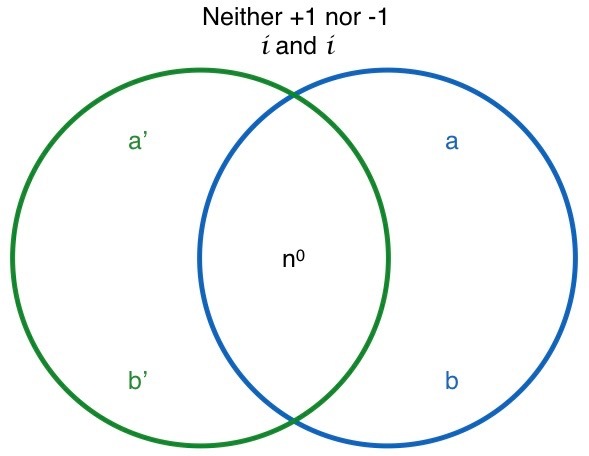 Why is the Observed a (3) rather than a (1)? Great question! The tripartite division of the universe in Prthivi (earth), Antariksa (atmosphere) and Dyau (heaven) is very well established in the Vedic literature. Each of them is called a “Loka” and thus the universe is “Triloka”, consisting of three lokas. Therefore the God is called “Trilokinatha” meaning the lord of the three lokas. During the immediacy of an experience, the Boundary Condition of the Object is decided. This boundary condition determines what is Inside and Outside of the Observed Object. Also, the moment of experience determines what was Before it and what will be After it. Therefore, Observation segregates the Observed, as Content, from its Space-Time Context (represented by the full spectrum Number Line introduced in the previous chapter). God sees the light, that it is good. And he divides the light [content] from the darkness [context]. Whenever two phases are formed, there is always an interface between these phases. Antariksa is the interface between Prthivi [Mother] and Dyau [Father]. Antariksa is the junction of Prthivi and Dyau. The three lokas were formed not because the universe was divided in three, but because it was divided in two. [I]n this division lies the ultimate secret of the universe. Dr. Roy describes the universe at the cosmic level. What about the other end of the spectrum? Hydrogen atoms are the smallest in the universe, having only one proton and one electron. An electron has a -1 charge and is outside of the positively charged proton. The atom’s charges could be represented like this: -1 (1). The proton is in parentheses and the electron swarms around it. However, the proton’s +1 charge comes from THREE quarks. Two Up quarks contribute a +2/3 charge (2/3 + 2/3 = +4/3), and one Down quark brings a -1/3 charge to the mix (4/3 – 1/3 = 3/3, or +1). If we represent the electron and quarks as particles instead of charges…voilà! We get -1 (3). Observation is the lower-quadrant Public Daytime relationship between the Observer -1 and the Observed (3). Gone without a trace is the mingled-in (ai+1b) (ai-1b), the progenitors of the singled-out -1(3). Being has come from Not Being, the upper-quadrant Private Nighttime relationship of the indeterminate Everything-Nothing. With that being said, let us reconsider an illustration introduced in the previous chapter because it depicts so remarkably well the correlated values that run parallel to each other on our new number line. 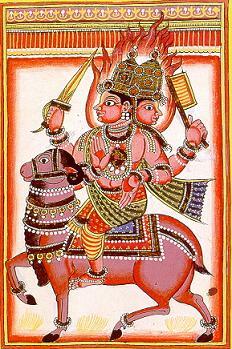 Notice that the rider is two headed and all fired-up. Facing in two directions, the rider attends both what has come already and what may yet be coming. Weapons are drawn in both defense and offense. The artist who painted this image invites us to consider our own lives, to ask ourselves if we are looking everywhere but here-now, wherein our peace prevails. And when he was demanded of the Pharisees, when the kingdom of God should come, he answered them and said, The kingdom of God comes not with observation: Neither shall they say, See here! or, see there! for, behold, the kingdom of God is within you. Fractal Corporeality is observed from the lower quadrants. In selecting an instantiation (a ternary unit 1), the -1 Observer designates the unit’s inside and outside, and its before and after. The multi-dimensional fractal (3) coincides with the Observer’s time-line. A memory of each encounter gets appended to memories of previous encounters. The new number line shows this accumulation as an additive-summation series. The colorful illustration above depicts the pair of inverse space-times of the Observed (the two-headed warrior) and the linear advance of the Observer‘s memories in time (the ram). But who shall comprehend from beyond both of these perspectives? To see ourselves from a higher perspective is to be self-aware. The unknown painter of the symbolic image above is obviously a self-aware wisdom teacher; his message conforms to the gospel of Jesus. Where is our “kingdom of God”, our true being and knowing, our Omnipotence and Omniscience? ECP is not far-flung; it is always everywhere. The quiescent equilibrium is accessible within ourselves. Rest-oration allows the Word(s) that become flesh to return to silence. Every solute achieves resolution in the domain of the indeterminate Everything-Nothing. There the Mother and Father are eternally One, undisturbed in their intimate embrace. Represented in my dreamspace as (ai +1b) (ai -1b) is the root of all dynamical enterprises. That which cannot be seen directly, but by logical inference can be known, as both the source and solvent of the manifest universe — THIS is the only essential and ultimate inevitability. All of this came about because I asked with complete earnestness to know how to decode diverse creation stories so that their unified truth would be revealed. Miraculous! If you do not really “get” what has been put forth here, it is probably because I have offered you an answer to a question you have not yet asked. Nevertheless, you may have been tickled somewhat by how seemingly random pieces have fallen together quite neatly. Keep in mind that this is my art; all of it flows through me from who knows where? Of course it comes not from Nowhere! Instead, it comes from the meta-physical realm of the collective Consciousness, hidden invisibly in the Space that is Everywhere around and beyond us, permeating us through and through, around and within all of our Parts, as well. When we are under the influence of art, we may feel all sorts of things that we do not understand intellectually. By resonance we are stirred, regardless. What lies beyond the bounds of our routines? What if we dare to be curious? For all of us a quest awaits! All of our questions tune our receptors. Not only do our dreams bring us answers, but our daily experiences play out as a result of our personal receptivity. Should you wish to jump over to a talk I delivered at Swannanoa in 2014, I have provided the link: Do Your Questions Serve Your Quest? Enjoy!